Aeroecology is an emerging discipline that has potential for addressing transformative questions concerning the ecology of airborne organisms at broad spatial and temporal scales. Answers to these questions promise to improve our understanding of the effects of global phenomena such as climate change and anthropogenic impacts on biodiversity and ecosystem integrity as well as to inform environmental management decisions. 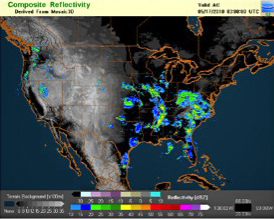 Next Generation Radars (NEXRAD) is a continental scale observing platform for both Meteorology and Biology that is operated by NOAA and covers virtually the entire US. This radar is used to forecast our weather, but also detects birds, bats and bugs. These animals interfere with the weather data, but are a gold mine for biologists. Weather radars (including national networks such as NEXRAD) currently collect enormous quantities of data in both real-time and in archived databases that offer vast potential for advancing research in aeroecology. In addition, ongoing advances in portable radar technology hold considerable promise for revolutionizing our understanding of climate change and the behavior of organisms in the aerosphere. 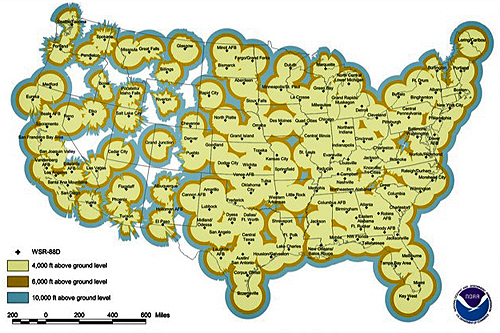 NEXRAD data are continuously archived and made publicly available through the National Climatic Data Center (NCDC), providing an invaluable asset for broad-scale longitudinal studies. 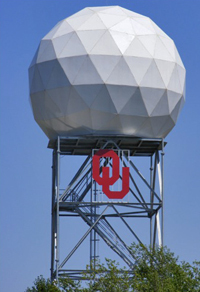 The benefits and uses of NEXRAD for weather monitoring and forecasting are well known; however, the use of this radar network for aeroecological studies remains limited. 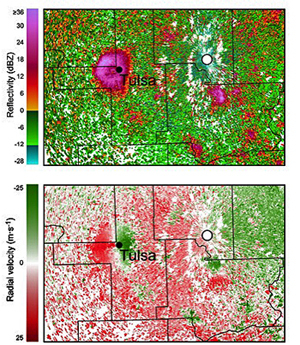 The capacity of radars to detect biological scatterers in the aerosphere has been known for 50 years and NEXRAD data have been used since the 1990s for quantifying coarse movement patterns of birds, flying arthropods, and bats by using clear-air mode reflectivity values to detect and track these biological targets . NEXRAD currently has a limited ability to reliably discriminate among targets of different biological origins, but operational upgrades to support dual-polarimetric capabilities to existing NEXRAD installations should greatly enhance abilities to discriminate among types of biological targets within the next five years. Current radar products have limited utility for biological investigations owing, in part, to a lack of collaboration and understanding among radar scientists, atmospheric scientists, and ecologists, that results in a largely underutilized database of biological targets in the aerosphere and a paucity of tools with the resolution and capacity to detect and discriminate among organisms in the lower-most strata of the atmosphere where biological targets are most prevalent. Above is an example of roost rings resulting from the emergence of Brazilian free-tailed bats in south-central Texas as observed in the non quality-controlled composite reflectivity data produced through NMQ. The image corresponds to observations made on June 25, 2009 as the bats were dispersing from their roosts at dusk to feed on insects. Since these data were collected at dusk, sun spurs can also be seen in the images. Also shown are the location of WSR-88D sites and bat roosts. During some periods, most of the reflectivity detected by NEXRAD radars is biological - primarily birds, bats and bugs. 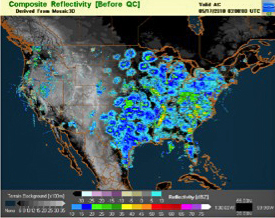 The images above display composite reflectivity obtained from the NMQ web portal May 17, 2010. 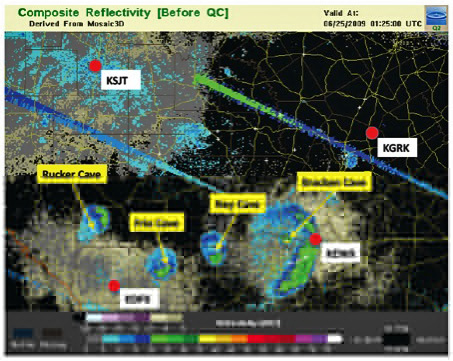 The left panel shows a reflectivity map before applying quality control to remove non-meteorological effects. The date is near the peak of nocturnal spring migration of songbirds in the northern part of the U.S.; insects and probably bats also contribute to the radar return. The lower panel shows the same data after quality control. The underlaid grey shading denotes terrain elevation with lighter colors repesenting higher elevations. Measuring radar cross sections in an anechoic chamber is a fundamental part of validating radar measurements. The above images show radar cross section measurements made in the anechoic chamber of the University of Oklahoma Radar Innovations Laboratory. 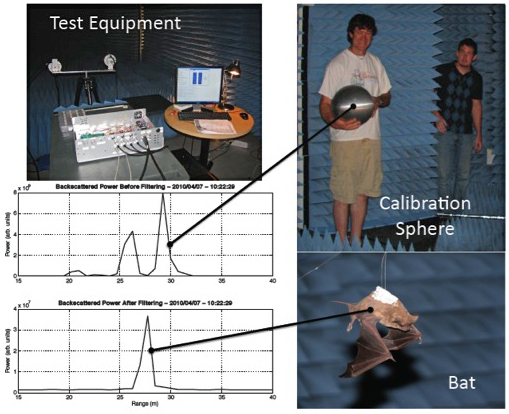 Data of a live tethered bat were collected using a low-power X-band pulsed Doppler radar. A 12-inch metal sphere was used for calibration. Results are shown in the plots. Similar data are being collected for other species. Development of novel tools and radar products, such as continental scale “bio-scatter” maps, algorithms for distinguishing biological targets from weather-based targets, 3-D rendering of biological targets, quantification of aerial biomass, and a web interface for product dissemination and visualization, promise to advance research outcomes and educational outreach in aeroecology. 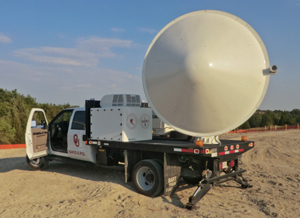 We use mobile radars to study emergences of birds and bats.